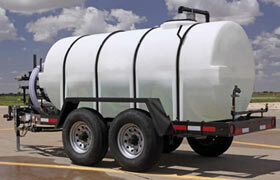 Water Tank Trailers for Every Job! Whether you need to clean horse stalls, spray a construction site, or water a ballfield, there is a water tank trailer for every project. These trailers allow you to transport water to job sites, farms, arenas, or any remote location where water may be needed. 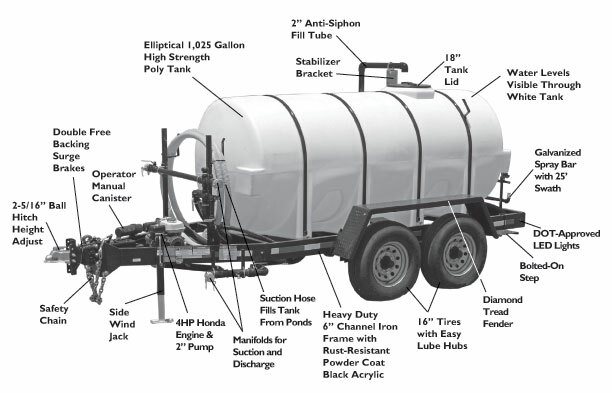 Each water tank trailer features a standard package of high-quality equipment, including a Tsurumi Pump and Honda Engine for quick and easy tank filling and discharging. 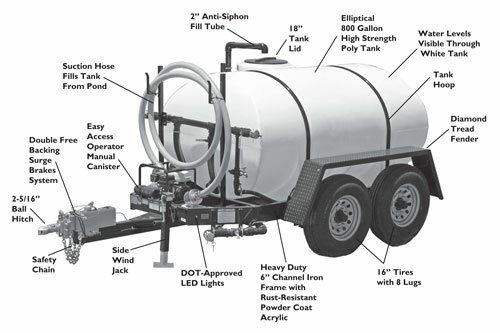 Additionally, each of our water trailers for sale is DOT compliant. You can tow it on public roadways with confidence. 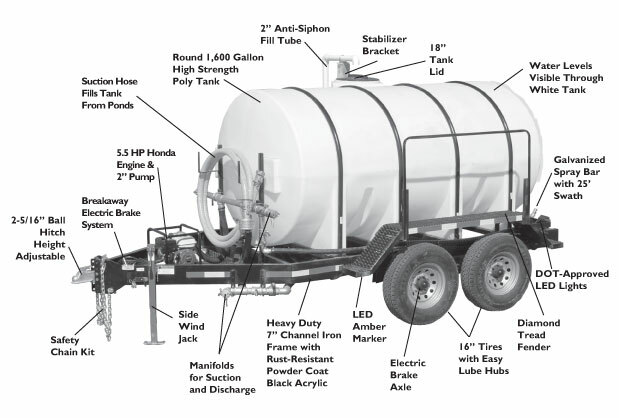 The Express 800 Gallon Water Trailer is the largest water transport trailer to fit under the United States Department of Transportation's (DOT) requirement to obtain a commercial driver's license for public road use. This allows you to carry the maximum amount of water on or between job sites and use public roads to reach your destination with your standard driver's license. If you're in need of a larger tank to handle bigger tasks for your job site, farm, or arena, the Express 1000 Gallon Water Trailer allows you to carry more water while maintaining easy maneuverability. 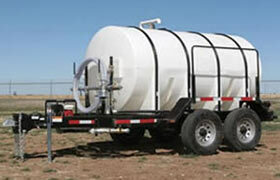 If you spend all day on the farm or job site, this water tank trailer can minimize trips to refill the tank. 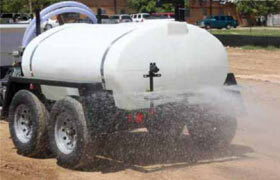 The 1600 Gallon Water Trailer is a heavy-duty trailer designed to handle those big projects that require more water. 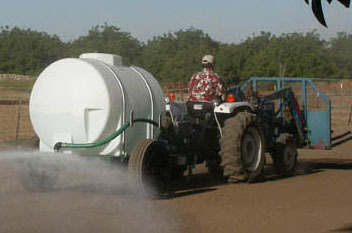 This is a great option for spraying horse arenas, ballfields, or farms. Additionally, this trailer features a 5.5 HP Honda gasoline engine, allowing you to control the range and flow of your water output. 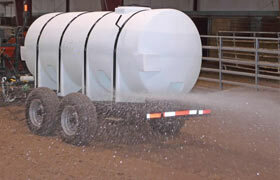 The Arena Mounted Water Tank Trailer is available in either 500 or 1000 gallons andincludes all the necessary equipment to pack dirt before an event, wash livestock, disinfect stalls, or control dust in your arena's parking lot. 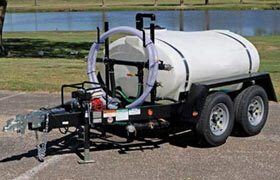 The nurse trailer allows for safe and efficient liquid fertilizer transportation to the field. 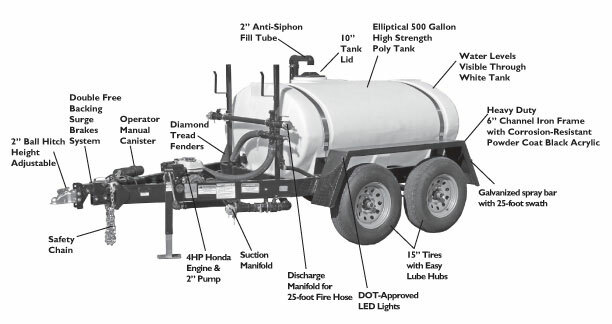 This heavy-duty trailer is available with a 1000 or 1600 gallon tank and is DOT complaint for public road use. 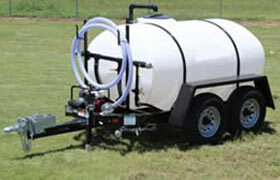 For more information on this trailer, see: Agricultural Nurse Trailers For Sale. The deicer trailer makes for easy and efficient deicing of streets, bridges, and parking lots. Equipped to handle harsh winter conditions, this DOT-compliant trailer will help you create safe driving conditions for your community. For more information on this trailer, see: Deicer Trailers For Sale. If you still are unsure about which tank might work best for you please give us a call! We're available at 1+772-646-0597 and our team is always willing to assist and help find the perfect tank for your application.